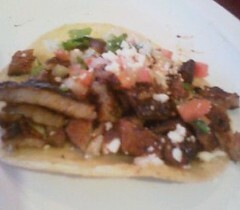 This taco al pastor is from “A Taste of Mexico” in the Princeton Shopping Center. Now, if you want a chuckle, see the rumor mill version at Snopes. I hadn’t heard this chestnut before, but a jokester friend of my father’s just forwarded it to me in an email!